All of the above occurred in April and May (I've been horrible about indexing/arbitrating so far this month). 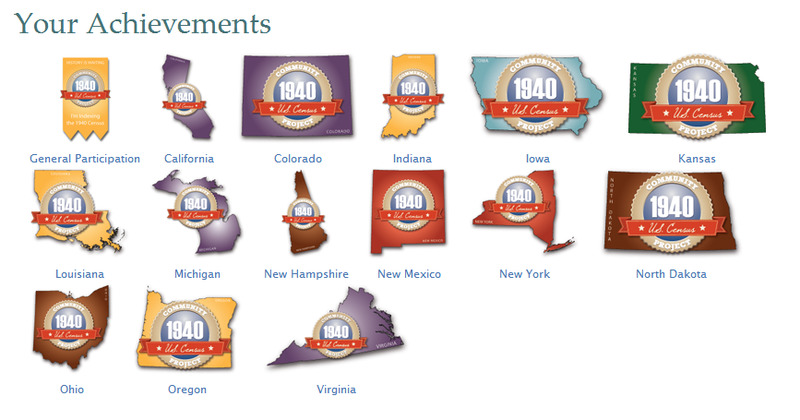 It is fun to see which states I've worked on, and I had actually forgotten about a few of them. The vast majority of batches I've done were for California, with North Dakota, Iowa, Indiana and Ohio rounding out the top five. Here is an anecdote for you: I have no ancestors from North Dakota and have done little research there. So why did I do so many batches from there? Because every batch I worked on (roughly 20 in all) had excellent handwriting - North Dakotans should be proud! Sign-in to FamilySearch and check here to see which badges you've earned. You've worked on a lot of states, Leah! Great job. It never occurred to me to choose a state because of the handwriting -- but I'll think about that now! Thanks for the hint. There's An Expo Coming to Town!